Another Halloween Themed Bento for lunch today. I made a "tombstone" sandwich with PB&J. On the top of the sandwich is a stencil of a skull and crossbones! I got the stencil from Wilton and also used their brand of edible food spray paint. Wilton Halloween Mini Stencil Set, 8 Piece is the set I picked up with fun witch hats, spiders, skulls, and more. Wilton Black Color Mist is the food spray paint I used. Also in this bento: baby carrots, cherry tomatoes, cucumber slices, and daikon radish sprouts. I have included this bento in Shannon's What's For Lunch Wednesdays blog. Be sure to check out the fun lunch ideas posted there! This bento post also happens to be number 80 for me, which means another donation to the Redwood Empire Food Bank! Yay! Every 20 posts, I make a donation to my local food bank, because I think everyone deserves a healthy lunch. Food banks and other charities are suffering because of our tough economy, but if we can all commit to donating just a little, we can help feed the hungry in our neighborhoods. I am donating one dollar per post, so today marks another $20 donation. Special thanks to Susan Yuen of Hawai'i's Bento Box for her great inspiriation, and shining example. Congrats on 80 bento posts and your generous donation! Thanks sheri! 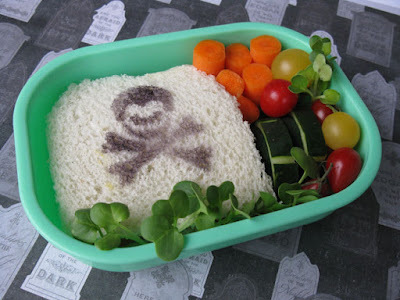 This was a very quick bento, and the stencil was very easy to use. Thanks Emily! Simple is often best! Congrats on 80 posts! It goes by so fast. You're doing a wonderful thing with your donations! Yay! food spray on a sandwich, awesome! Just love your bentos. And what a great thing to do with the donations! Congratulations on your 80 posts! wow, time goes fast. Lovely idea with the stencil! Just proving you don´t need tools meant to be used only in bentos to make a nice presentation! Thanks Ohayobento! Time is flying! Hi bobo! The stencils are really easy to use. Be sure to hide the rest of your food though, because you might accidentally spray it, too! Thanks karaimame! Yes, I am always trying to think of fun ways to make bentos with non-bento tools. Have a spooky day!